Very good condition with minor wear, near mint. Magazine was not in print for long. See table of contents page picture for full content of this issue. Very good condition with minor wear around edges. Included are: 1985-5 and 1986-9! 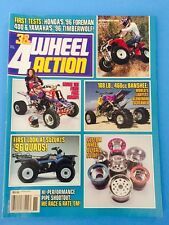 These magazines are a great addition to any collection and is a nice way to reminisce. All the best! Very good condition with minor wear to edges. MAG Box 22. This is in overall fair condition. This shows wear from use, display, handling and or age as noted in the photos. The actual item is represented in the above photos. MAG Box 24. This is in overall fair condition. This shows wear from use, display, handling and or age as noted in the photos. The actual item is represented in the above photos. 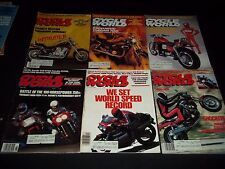 Harley Davidson Enthusiast magazines 1986 in excellent condition. Cycle News Newspaper - May 7, 1986. Cycle News Newspaper - August 6, 1986. MAG Box 21. This is in overall fair condition. This shows wear from use, display, handling and or age as noted in the photos. The actual item is represented in the above photos. Included are: 1985-9 and 1986-9! 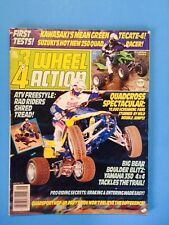 These magazines are a great addition to any collection and is a nice way to reminisce. All the best! Cycle News Newspaper - June 11, 1986. Yellowing from age. Bottom corner has creases. This is a 30 plus year old publication and shows wear. Zoom in and inspect all pictures for condition. Cycle News Newspaper - September 17, 1986. Yellowing from age. This is a 30 plus year old publication and shows wear. Zoom in and inspect all pictures for condition. Cycle News Newspaper - February 5, 1986. Cycle News Newspaper - October 8, 1986. Cycle News Newspaper - April 23, 1986. Yellowing from age. This is a 30 plus year old publication and shows wear. Zoom in and inspect all pictures for condition. Cycle News Newspaper - June 18, 1986. Yellowing from age. This is a 30 plus year old publication and shows wear. Zoom in and inspect all pictures for condition. Cycle News Newspaper - August 20, 1986. Yellowing from age. This is a 30 plus year old publication and shows wear. Zoom in and inspect all pictures for condition. 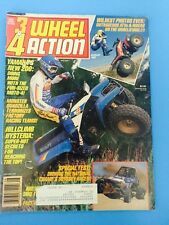 Cycle News Newspaper - December 3, 1986. Yellowing from age. The cover states Dec. 3/Dec. The pages state December 3. This is a 30 plus year old publication and shows wear. Zoom in and inspect all pictures for condition. Cycle News Newspaper - January 8, 1986. Top right corner is cut out. Yellowing from age. This is a 30 plus year old publication and shows wear. Zoom in and inspect all pictures for condition. 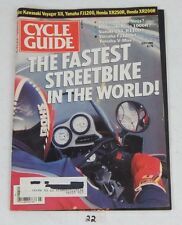 Cycle News Newspaper - January 15, 1986. The top section of the cover page is is cut out. The next page has a slit thru it. Yellowing from age. This is a 30 plus year old publication and shows wear. Cycle News Newspaper - January 22, 1986. Yellowing from age. This is a 30 plus year old publication and shows wear. Zoom in and inspect all pictures for condition. Cycle News Newspaper - February 12, 1986. Yellowing from age. This is a 30 plus year old publication and shows wear. Zoom in and inspect all pictures for condition. Cycle News Newspaper - February 19, 1986. Yellowing from age. This is a 30 plus year old publication and shows wear. Zoom in and inspect all pictures for condition. Cycle News Newspaper - February 26, 1986. Yellowing from age. This is a 30 plus year old publication and shows wear. Zoom in and inspect all pictures for condition. Cycle News Newspaper - March 12, 1986. Yellowing from age. This is a 30 plus year old publication and shows wear. Zoom in and inspect all pictures for condition. Cycle News Newspaper - March 26, 1986. Yellowing from age. This is a 30 plus year old publication and shows wear. Zoom in and inspect all pictures for condition. Cycle News Newspaper - April 9, 1986. The top section of the cover page is is cut out. The next page has a slit thru it. Yellowing from age. This is a 30 plus year old publication and shows wear. Zoom in and inspect all pictures for condition.